Noctua is a web-based tool for collaborative editing of models of biological processes. You must Login to create or edit models. Models may be viewed without login. Using AmiGO 2 Labs, search a somewhat recent (once or twice a week) scan of the models created using Noctua/Minerva. Welcome to the general public face of Noctua. Current development is very rapid, so some of these docs may be out of date. Software Developers -- Development and technical documentation can be found on the GitHub repository. Check back on this site throughout 2017 to see progress! 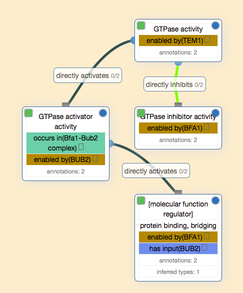 This instance is configured for use with the Gene Ontology project. The current preview instance is available here; for a toy example model, see one of the scratch models. Given the distributed nature of Noctua and how it works, some aspects of saving may be unintuitive. The first thing to understand is that Noctua regards "saving" as a working model being flushed to disk (and saved to GitHub). When you are logged in to Noctua and editing, all of your changes are persistent, as in they will continue to exist between login sessions, but they are not "saved". If Noctua is restarted for some reason, any changes that were made after the last save will be lost. Next, Noctua does not autosave--you must click the "Save" under the [Model] menu in order to save your edits. Finally, when working on something that you would like to preserve into the future, just like when editing in a word processor, please get into the habit of periodically saving your models. The bulk of major issues and feature requests are handled by the tracker (https://github.com/geneontology/noctua/issues). If something is not mentioned here or in the tracker, please contact Seth or Chris. Various test methods to look at how capella kick-ins behave. You do not want to be using this right now. No admin available here--did you remember to login? A configuration error is also possible.